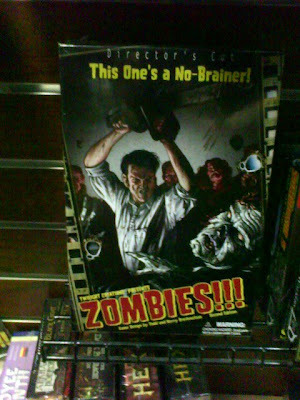 Home » board games , bruce campbell , humor , quentin tarantino , zombies » Quentin Campbell fights the Zombies!!! Quentin Campbell fights the Zombies!!! While we were in HyperMind, I spotted this game box and took a picture of it with my new cellphone. It's something called Zombies!! !, the "Director's Cut" version. And I've been told that it's a pretty popular tile-based strategy game. But what caught my eye was the chainsaw-wielding protagonist fighting off the undead on the front of the box. I can't figure out if that's supposed to be Quentin Tarantino or Bruce Campbell. Just for fun I took it around the store and showed it to some more people. The opinions were pretty evenly split: about the same number of people thought it was Bruce Campbell as thought it was Quentin Tarantino. What do you think? If you need a better look aim your sights at the Zombies!!! entry on BoardGameGeek. You're a little late on this one, Chris...the games already had several supplements out, including one set in a school, and one with zombie dogs! You can even get extra glow in the dark zombies and victims for the game!